The Panzer IV/70(A) is a gift Rank III German tank destroyer with a battle rating of 5.0. It was introduced in Update 1.41.27. The Jadgpanzer IV/70 is an effective anti-tank weapon. It is armed with a 75mm gun and is very capable of taking out the armour it faces at its rank, with only one shot needed to dispatch them. Taking advantage of its good speed of 40 km/h, head over to sniping locations, and using its good frontal armour at distance, can easily knock out enemy vehicles easily with little danger and risk. However, the Panzer IV/70 (A), is arguably less effective than its counterpart built by Vomag, the Panzer IV/70(V). The vehicle's tall profile has positive and negative aspects. It means it is more visible, especially at longer ranges. 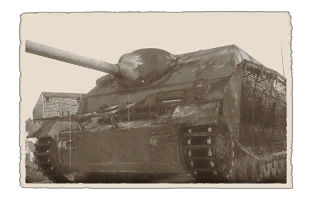 However, it does allow the player to see and shoot over taller obstructions that the Panzer IV/70(V) would be unable to. The lack of a turret means the player should not be overly aggressive. The vehicle cannot turn particularly fast. The gun traverse is limited, so a fast vehicle can easily get behind it. This tank should stay back and use the excellent muzzle velocity and penetration of the L/70 cannon to destroy targets from afar. Stay in cover, or behind the team's mediums and heavies, and provide fire support. But don't be an obvious target. The tall-slab sided IV/70 (A) is very vulnerable to flanking fire as the side armour is only 40mm thick. Even parts of the front armour are a little lacking; certainly inferior to the Panzer IV/70(V). The sloped upper superstructure gives an effective thickness of around 125mm, very good for this BR, but it has an unsloped 80mm hull and an 80mm lower hull that is only very slightly sloped. Forward speed is sufficient, topping out at 40 km/h (approximately 25mp/h), but the reverse speed of 7 km/h (approximately 4mp/h), while acceptable, isn't anything special. This vehicle isn't a speed demon, and isn't built for lightning fast flanking maneuvers. It's much more comfortable behind the lines, acting like an anti-tank gun with treads that responds to threats rather than spearheading assaults. At this rank, the L/70 cannon can punch through almost any vehicle that may be encountered, with the US Sherman Jumbo and Russian IS tanks being the only real tough nuts. The IV/70 (A) is strong, but has weak armour for the rank. Try to trade blows with most enemy vehicles as the armour simply doesn't provide comprehensive protection. This, coupled with the very vulnerable, large flanks makes it highly unsuitable as a front line assault vehicle. The hull sides are protected by an extra 5 mm thick plate to provide protection against HEAT and HE rounds. The side of the IV/70 (A) is a goldmine of weak spots for an accurate player. Aiming for the ammunition is recommended. Use the rods on the side of the hull as a reference point, and aim down, a foot or so below the top of the mesh skirts, and an ammunition detonation is almost certain. From behind, it is advisable to aim for the large, flat rear superstructure above the engine deck. The Commander and Gunner can be eliminated with a single well-placed shot. After the Gunner is taken out, aim for the engine to prevent the vehicle from turning to engage Panzer IV/70(A). Avoid firing at the mantlet. It is heavily sloped and in excess of 200mm equivalent flat armour. This vehicle is very much a defensive weapon that should only be on the offensive if the situation is desperate. The gun it is armed with is one of the best at this rank. In terms of penetration and muzzle velocity, it will make short work of all but the toughest tanks. When taking fire, however, the IV/70(A)'s protection is inconsistent at best. Shots that strike the sloped upper superstructure are likely to bounce, but anywhere else and the shell will almost certainly penetrate at closer ranges. It is best to avoid confrontation if possible and let the other members of the team take the damage to allow the player to pick and choose the engagement. Ideally, the enemy won't have a chance to return fire. Allow room between the Panzer IV/70(A) and the enemy, and avoid traversing high-traffic areas; instead, keep an eye on them from a distance and let the enemy come towards the Panzer IV/70(A). Urban areas should be avoided if possible. Entering such an area is an invitation for the enemy to flank, and the closeness of the engagements negates the main advantage of this tank: the gun. Engaging the enemy at close range doesn't utilise the L/70's excellent penetration at range. In Arcade battles, with the shot indicator showing the player where shots will land, the high-velocity L/70 can accurately hit targets at long ranges, and targets on the move as the shells arrive quickly at the target. The penetration indicator, which changes colour based on the chance of successful penetration, is a problem for the IV/70 (A). It highlights the weak areas of the tank to enemy players, making the weak spots obvious. Arcade tends to be faster-paced than Realistic and Simulator, so the lack of a turret may be a large detriment as being flanked is quite common in this mode. With a lack of markers above tanks and larger combat zones, Realistic and Simulator suit this vehicle well. Taking up a concealed firing position and engaging enemies from a distance is what this tank excels at. Be mindful of flanking attacks though, if consideration of exposed flanks and careful checking of these areas is not performed, it will likely be too late to respond to an enemy on a flank or behind. Keeping with the 'anti-tank gun with treads' analogy, zooming across the map and looking for enemies is not how this tank should be played. Let the enemy do the work, because this tank is very poorly suited to assaulting. Usage of the binoculars is highly advised as they allow a zoomed-in 360 degree view without having to move the vehicle. Excellent frontal armour, and combined with range, can be near impossible to penetrate. In September 1942, the Wehrmacht arms bureau called for a new type of assault vehicles. The specifications listed were 100 mm front armour, 40-50 mm on the sides, wide tracks, a top speed of 26 km/h, ground clearance of 50 cm, and a very low firing position. The design was to be armed with the 75 mm Pak 42 mounted on the Panther tanks. Though this project was originally conceived over a completely new chassis, the Panzer IV was chosen to be used instead. The design was to have a low silhouette and an enclosed casemate fighting compartment after experiences with the Marder IIIs showed that such features were necessary for a successful fighting vehicle. The Panzer IV chassis was converted into the Jagdpanzer IV, which featured new designs to the original. The utilization of the Panzer IV chassis was met with much criticism by General Heinz Guderian, who saw the diverting of Panzer IV tank resources as unnecessary since the current assault gun StuG III was more than adequate in the role and Germany still needed reliable tanks that it could use. The vertical front hull armour was replaced with large sloped armour plates, ammunition and fuel were moved to accommodate the new superstructure design, and the auxiliary engine that once powered the Panzer IV turret was removed. The superstructure had 80 mm thick sloping armour that gives it an effective 100 mm thick. To simplify the production of this vehicle, the superstructure was essentially made of large interlocking plates that are welded together. The vehicle had a crew of four, the commander, gunner, loader, and driver. The vehicle was armed with a 75 mm gun, though originally suppose to be the one from the Panther, shortages forced the mounting of older guns such as the 75 mm Pak 39 L/48 cannon, which were less powerful than the Panther's PaK 42, but were still lethal. Due to the different gun mounts, three main variants were produced from the Jagdpanzer IV, the original Jagdpanzer IV (with the 75 mm Pak 39 L/48 cannon), the Panzer IV/70 (V), and the Panzer IV/70 (A) (Both of which have the 75 mm Pak 42 L/70 cannon). The Panzer IV/70 (A), mounting the 75 mm Pak 42, was produced by Alkett, a manufacturer of the StuG III (hence the "A"). It was produced from August 1944 to March 1945 and was made for the purpose of simplifying the design for easier manufacturing and increased production rate. To make production easier, the design used an unmodified Panzer IV chassis, while the previous two used a modified superstructure built up from the suspension. The unmodified chassis gave the Panzer IV/70(A) the flat frontal hull known on the Panzer IV design, with which the sloped armour is built on top of. This in turn caused the overall height of the vehicle to be increased by 50 cm, which gave it a much bigger silhouette, but was done to simplify production and send more of the 75 mm Pak 42 L/40 to the front lines as quickly as possible. The Panzer IV/70 (A) was more of an interim solution in order fulfill battlefield demands, only about 278 units were produced before production ended. The early version had zimmerit anti-magnetic paste added to the vehicle. However, the zimmerit was removed after September 1944 due to rumors that they were causing vehicle fires. Other modifications were made to the design over time, but the biggest change in its production was the addition of Schürzen side armour plates. The Jagdpanzer IV (the name was interchangeable between all of its variants) was first issued on March 1944 and was employed in anti-tank role in the Western and Eastern Front. The Jagdpanzer IV participated in the Normandy Campaign, Battle of the Bulge, and the Soviet Offensives on the Eastern Front. Their overall performance was very successful as tank destroyers and only sub-par in other roles that are usually taken by tanks or assault guns, as the high-velocity 75 mm cannon it mounts were unsuitable for anti-infantry and fortification purposes. However, they were soon put in positions of tanks due to shortages of capable fighting vehicles in German inventory. One of the popular Jagdpanzer IV aces was SS-Oberscharführer Rudolf Roy who was attached to the 12th SS Tank Destroyer Battlion. He was killed while looking out of his Jagdpanzer IV hatch during the Battle of the Bulge. After World War II ended, the Jagdpanzer IV's design still saw service with the German Bundeswehr as the Kanonenjagdpanzer, which has nearly same design as the Jagdpanzer IV, but most notably with a 90 mm gun. Some captured Jagdpanzer IVs were given out by the Soviet Union to Romania and Syria, but Romania scrapped all the German armour by 1954 and Syria used them in conflicts against Israel until 1967. This page was last edited on 13 January 2019, at 19:20.